While visiting Sicily don't miss the opportunity of booking a Taormina hotel to embellish your trip with a stay in a city that is a must to discover the thousands-year old history of the island, its past civilizations, the deep blue sea and all the monuments that have centred Sicily's tourism in this area. Book at the La Plage Resort and you will have the chance to get the best out of your experience. 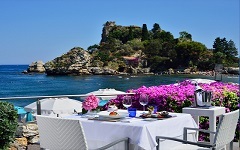 Booking a hotel in Taormina it's the perfect choice for all seasons: the mild weather, the all year round enjoyable beaches and the native vegetation that never loses its luxuriance, will transform your stay at the La Plage Resort, no matter the month, in an unforgettable experience. Along with elegant bungalows right in front of the sea the La Plage Resort, the wonderful Ragosta Group's Taormina hotel, features suites and deluxe suites with double and spacious bedrooms, private gardens with a private outdoor Jacuzzi and stunning views of the Isola Bella. Book now your stay, you wuill not regret the choice!